Being a picky eater as a kid is totally fine, but most of us eventually grow out of insisting our sandwiches be crustless and our dinners be broccoli-less. And then there are grown adult men like Mike Roman, who didn't so much as grow out of his childhood obsession with melted cheese, sauce, and bread as he did embrace it by turning it into a lifelong habit that's involved eating pizza every single day for the last 37 freaking years. Mike Roman, we salute you. 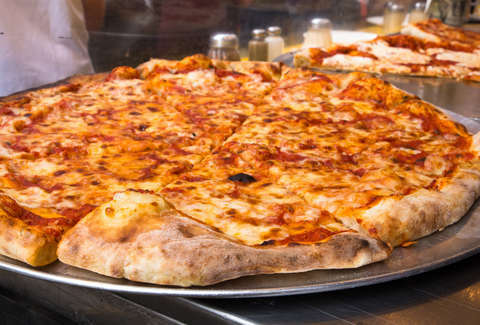 Roman, a 41-year-old teacher by trade who lives in New Jersey, hasn't gone a single day without pizza since he was 4 years-old, which he recently revealed on an episode of the "New Theory" podcast. In it, he discusses that he simply doesn't like to eat anything else for dinner, and hasn't since he was old enough to be enrolled in Pre-K. In fact, he claims he actually ate pizza for both lunch and dinner for a whopping 30 years. Now, though, he switches things up a bit by chowing down on peanut butter sandwiches midday, but remains committed to keeping up his pizza-for-dinner routine. As for his pie of choice, he's a purist, and prefers no toppings besides cheese. Apparently, he also doesn't ever get sick of eating the same thing every day, and doesn't consider it weird to do so. "I don't know [why]," he told the NT podcast host Tom La Vecchia. "Dinner to me is nothing really that special." In the interview, Roman laid out a few more details. For instance, he prefers to go out for a slice rather than make pizza at home, and made sure he kept up his habit even on his recent wedding day and honeymoon. Miraculously, he also claims to be in perfectly good health and has maintained a healthy weight despite the questionably nutritious lifestyle. "Pizza has three of the four basic food groups," he said. We couldn't agree more, Mike.